A number of people who are located in various places around the country have contacted me and said they have not been able to access my "Sentimental Journey" column on the Trenton Times website. In contacting the Times, I was told that they would check to see what the problem was and re-post my columns. 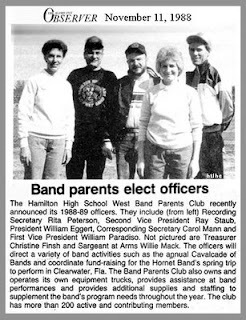 I just checked, and my last column (Nov. 15) wherein I recall Canteen night at Hamilton High School has been posted. Here's the link. Received this info about the passing of HHS56 classmate Paul Patterson from classmate Jake Hasili. Paul was living in the Dallas, TX area with his sister and had been suffering from cancer for some time. Just finished talking to Paul's brother about Paul's passing. He died on Saturday, Nov 22, 2008. Approx; 10;00 pm, Texas time. He was at his sister's home outside of Dallas, Texas. He will most likely be cremated and put by the remains of his parents in Texas. God Bless him, his suffering is over. This remains the worst part of this class communicator job but, unfortunately, it's also the most constant. Walt was living at: 7274 Bass St., Wewhahitchka, FL 32465. I don't know of any surviving family members beyond the brief description in the obituary. PORT SAINT JOE, FL - Walter Raywood, 71, formerly of Hamilton, passed away November 15 after a lengthy illness. He is survived by his brother Bob Raywood and his wife Pat of Titusville and several cousins, nieces, and nephews. Funeral services are private. 2008: HAMILTON HIGH: The "Golden Years"
This is the title page of the "ASTOUND!" 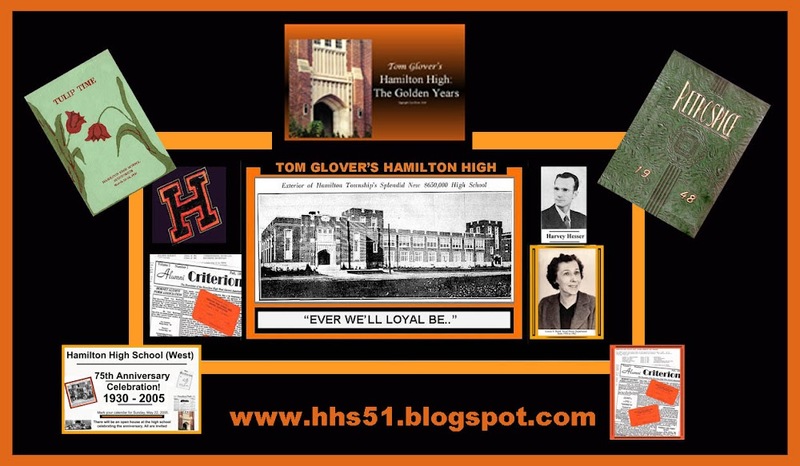 multimedia presentation which I presented to the public at Hamilton High's 75th anniversary celebration a few years ago. For at least 10 years, I have been sorting, choosing, scanning, and adding to this presentation so that at the present time it is quite lengthy (about 30 minutes) but quite interesting. I have arranged the program chronologically from the establishment of the school right up to the mid 1950's, where I encountered a serious gap in my yearbook collection. "Astound!" software is similar to Powerpoint, but has animation features which I don't find in Powerpoint. Unfortunately, "ASTOUND!" is obsolete. I will be working on converting the program to Powerpoint. It will be a very long and tedious process. The "Golden Years" presentation is "open ended," which allows me to add material as time permits. If and when Hamilton Township is able to once again support evening community programs, this will be projected on screen on the huge Kuser Mansion theater Cinemascope screen. What a joy it is, as I go through the pages of my newspaper collection, to find people with whom I have walked at some time during life's lengthy journey. I have been posting photos of World War II veterans who served valiantly during the years of "Greatest Generation." It is special when I find very close friends with whom I went to school. Thus it is with Karen, who spent all 12 years with me as we journeyed through the excellent Hamilton Township public school system. 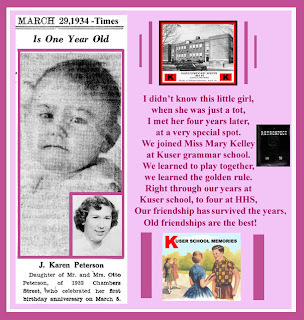 I was moved to write a short poem, along with Karen's photos and the results are depicted above. Love ya, Karen! One of the real joys of maintaining my websites lies in the fact that I am hearing from many of my friends and classmates from the past. As the old saying goes, "old Friends are the best friends." Carol was one of the many lovely ladies who made up the choir at Hamilton High during the late 40's and early 50's. It was so great to hear from her after all these years. 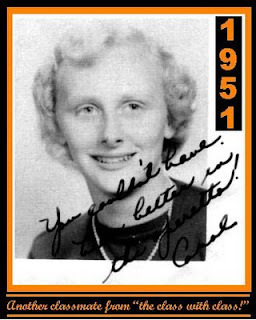 By the way Carol, even as you pictured fellow classmates from memory before going to our yearbook, I didn't need to refer to our yearbook, either when I saw who sent the email to me. I immediately pictured the pretty young lady pictured above. I enjoyed reading all your information on your sites and can't believe I didn't know about them before this. Mercerville School and HHS certainly aren't the same anymore but I was lucky to have been able to experience the good years at a time gone by. Also, Trenton -- the movies, busses, and great department stores of days gone by. How I remember the quote you mention that Miss Baird instilled in all of us; "travel the world over-"-- I found a card with that quote on it years ago and have kept it and look at it often, remembering her every time. There's so much to comment on that I wouldn't know where to start but be assured they are all good memories. It was fun to hear of some classmates ('51) who contributed to your articles and I could actually picture them without going to my yearbook. That in itself is an accomplishment! I'll bet you don't remember (silly me) Hughes ice house (and a small store) at the intersection of Nottingham Way and Rt. 33. When I was in Mercerville School and also when getting off the bus from Hamilton, it was the place to stop for a soda and hang out with the "gang." (That term doesn't have the same connotation today!) It's been awhile since I've been out that way but I believe it was replaced by a fast food restaurant many moons ago, one of the original ones, not Burger King or McDs. You know, when a hamburger was 10 cents. I'm not sure that's there anymore. I have to get back on the sites and really spend more time going over all the articles again. It's amazing --thank you for doing it. P.S. My brother-in-law was in the Seiler family (meat packing) business. I'll have to ask if he knows anything about the Trenton Sausage Co. Seiler's was also in business for a good many years and was well known not only in Trenton but all over NJ and PA.